LIVING in New York can be stressful. Always hustle around you no matter where go. Honking horns, traffic, many different ethnic groups all around the city and the boroughs. Well it is called the city that never sleeps for a reason. After a long day of hard work, the average New Yorker likes to come home – by train of course – to a nice home with dinner cooked, and his kids waiting for him after they’ve had a long day at school. Dinner is done, the kids are in bed, and your average New Yorker loves to plant himself on the couch and watch what happened during the day on TV. News stations talk about boring topics, once in a while an important world issue comes up. He flips to ESPN and sees highlights from the Cavaliers, even though they’ve gotten off to a rough start, they’ll find their groove soon enough. Now the sports anchors decide to talk about New York sports. “Here we go again.”, he thinks. As a long time suffering Knicks, Jets, and Mets fan, he stops and think about their recent success, or lack there of. He thinks starts with the basketball teams. As of today, the Knicks are 4-10 coming off a win vs the winless and absolutely atrocious 76ers. There definitely weren’t any moral victories from the game for the Knicks. Yes they have a star in Carmelo Anthony, and up-and-coming young talent in Tim Hardaway Jr and Iman Shumpert. But they have a rookie coach in Derek Fisher (who many see as Phil Jackson’s puppet) who doesn’t have enough of a resume for people to trust him. This long struggling franchise has only won 1 playoff series in a little more than a decade, and since the glory days of Patrick Ewing, Charles Oakley, and James Starks, haven’t been very successful in the playoffs. 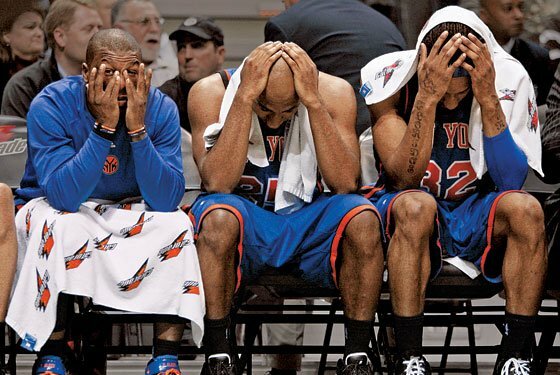 Knicks fans cringe when they hear names like Isaiah Thomas and Eddie Curry. A meddling owner doesn’t help the situation either. I could go on and on about how dysfunctional the franchise has been in recent years, but why rub salt on the wound? The other basketball team in town is the Brooklyn Nets. They’ve only been in town for 3 or so years, but they have a good amount of dysfunction as well. Even though in recent years they’ve managed to make the playoffs with veterans like Joe Johnson and Deron Williams, they’ve gotten bounced in the second round and almost lost to a young Toronto team in the first round this past year. With Deron Williams always having problems with his ankles and Brook Lopez being the definition of injury prone, it doesn’t look like they’ll go anywhere anytime soon. With the days of Jason Kidd behind them (as a player and a power-hungry coach), and with an owner that has publicly said that selling the team is a possibility, Nets fans try to look for optimism. Sadly, in the near future, there isn’t any. Well if the basketball teams are bad, the football teams cant be that bad…? Right? Nope. Both the Jets and the Giants (even though they both technically play in NJ) both have problems of their own. The Giants are 3-7 and are looking forward to a showdown with their division rival; the Dallas Cowboys. After an 0-6 start last season and Eli Manning throwing 27 interceptions, many fans questioned weather the G-men can return to the glory of 2012. This season hasn’t started well either. After an 0-2 start, there wasn’t much optimism to be found, but after they rattled off 3 straight wins, fans found hope. Since then, the Giants have lost 5 straight games and many are calling for Tom Coughlin’s job. No, they haven’t forgotten about the 2 amazing Superbowl runs he took them on, but many say he’s lost the locker room and is too old to be a coach in the NFL. With key players like Victor Cruz, Jon Beason, and Prince Amukamara out for the season, there isn’t a lot of legitimate talent on the Giants roster. A huge bright point in the season though, is rookie receiver Odell Beckham Jr. This guy is a stud, and even though he was picked number 12 in the draft, many believe he was a steal. GM Jerry Reese might have saved his job with this years crop of rookies like Beckham and RB Andre WIlliams Lets forget some of the outrageously stupid comments that Jason Pierre-Paul has made. Now we get the “circus” in town. The New York Jets. Where do we start? The 45 year championship drought? The instability in the front office? Or maybe the fact that the Jets haven’t had a HOF franchise QB wait forget that, a DECENT QB since ‘Broadway’ Joe Namath. You can choose any of the topics and talk about them for days, but we’ll save that for a different time. The Rex Ryan era in NY is probably finished after this year, unless the Jets run the table in their remaining games. After a week 1 matchup with the Oakland Raiders, in which the Jets barely escaped with the win at Metlife Stadium, the Jets rattled off an 8 game losing streak. In this embarrassing stretch, the “savior” at QB, Geno Smith, was benched for the injury prone veteran Michael Vick. Yes, they beat the Steelers in week 10, I’ll give them that. The Tebow saga cemented the Jets as the circus in town. Woody Johnson will likely clean house this off-season. New GM, Coach, and QB. Jets fans will be enduring pain for a little while longer. Now down to America’s pastime. Of course we all know that one of the greatest Yankees of all time, Derek Jeter, retired this past season. The Core 4 is history. Now the Yankees are looking for a face of the franchise. Not you Alex Rodriguez… The Yankee fans are still living in the 90s. They trying to forget that they missed the playoff the last 2 years and chasing big free agents might not bring them back. As a few teams such as the Kansas City Royals have proven, a small market team can succeed without throwing a lot of money to players like Carlos Beltran who as of now, was a complete waste of a roster spot for the Yanks. Don’t get me wrong; the Yankees could have a nice year. Hell, they might make the playoffs, but don’t expect another trophy anytime soon. This is where it gets interesting. Ever since 1986, the New York Mets have been “the other team in town”, the laughingstock, or just, you know, the Mets. Now it gets a little better. With the Yankees fading out of the playoff picture, the Mets have a chance to become THE team in NY. With pitchers like Matt Harvey, Jacob deGrom, Zack Wheeler, and a few other young stud pitchers, the Mets could find their way back into the playoffs. There’s just one aspect that is concerning. The Mets need one more star alongside David Write to become relevant. The owners, the Wilpons, might not be willing to dish out the money for one. Once they realize they are a move or two away from competing in the NL East, they might do so. When it’s all said and done, the Mets, (yes, the METS) might be the closest NY team to a championship. So your average New Yorker mostly sits and pouts about how bad most of the NY sports teams are, but there’s some optimism to be found. Things like Phil Jackson taking over the Knicks, up-and-coming rookie Beckham Jr. making incredible catches, and the Mets getting back into the playoff picture. Sports fans in the Tri-state area have suffered long enough and they might suffer even longer, but check back in 2-3 years. That might change.